The box will get removed soon, it's kind of useless for scroll-spying anyway. Daniel Beck added a comment - 2016-03-16 01:13 The box will get removed soon, it's kind of useless for scroll-spying anyway. Asking Tom FENNELLY for confirmation on the above. Daniel Beck added a comment - 2016-03-16 01:14 Asking Tom FENNELLY for confirmation on the above. Yes, that is a bug and is fixed in https://github.com/jenkinsci/jenkins/pull/2121. I also agree that the find feature is not so useful with scrollspy since the user can use cmd+f anyway. Maybe we should juts remove it for scrollspy. 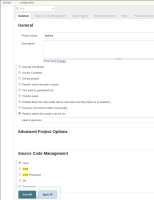 Tom FENNELLY added a comment - 2016-03-16 07:55 Yes, that is a bug and is fixed in https://github.com/jenkinsci/jenkins/pull/2121 . I also agree that the find feature is not so useful with scrollspy since the user can use cmd+f anyway. Maybe we should juts remove it for scrollspy. Well, if the search box is removed then both issue would become out-dated. Antonio Muñiz added a comment - 2016-03-21 15:20 Well, if the search box is removed then both issue would become out-dated.